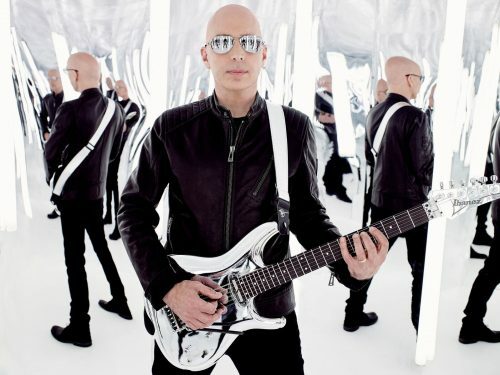 It has been quite a while since Joe Satriani played with DEEP PURPLE, but he’s back with a new album and a G3 tour in January. The G3 tour will feature Joe Satriani, John Petrucci and Phil Collen for the US leg and replace Phil Collen with Uli Jon Roth for the European dates. For further details and tour dates visit Joe Satrianis website. Posted by andreas on Sunday, November 19th, 2017, filed under Blog. You can follow comment on this post through the RSS 2.0 feed. You can skip to the end and leave a comment. Pinging is currently not allowed. I saw him playing with Deep Purple in Hamburg back in the 90’s and he and our band were really fantastic, a very powerful and enjoyable concert. The instrumental titles are announced as straight rock, more “back to the roots”. “Back in 1993, at the age of seven, my daddy brought my little brother and myself to Oslo. Wearing the worlds largest jacket, I got earmuffs at size of my thigh and placed at a chair in the middle of Oslo Spectrum. I was about to see my first concert with Deep Purple. Since then I`ve been back to see the band who has formed most of my musical childhood 10 times. We have seen Ritchie Blackmore drifting his own way, replaced by Steve Morse. We have said goodbye to the late Jon Lord (RIP), and whished Don Airey welcome. I named my first car “Highway star” to honor this lads and my little brother was humming “Smoke on the water” before he could talk. Yesterday I attended my tenth, and probably the last Purple-concert. It was great. The same crowd of middle-aged men without rhythm, kids who recently discovered new heroes and old rockers with messed up bear and worn t-shirts made the atmosphere electric. Don Airey earned a place in my, at the time, 16 year old heart by playing four excerpt from Peer Gynt, and made the basis of eternal admiration by playing the same piece this time. The guys on stage is in their 60-70tees, but my god what a concert. I can only kneel down and pray to any Rock-God that I will be in the same shape when I pass 70.